I found this recipe in the July 7,2009 issue of Woman's Day. It can also be found here. I served this cheesecake at a recent pool party that I hosted. I thought it was a great dessert for summer! 1.Preheat the oven to 325°F. Spray an 8 x 3-inch springform pan with cooking spray. (I used the cooking spray as the recipe called for but wished I had used Crisco/parchment paper. 2. Crust: Put the cookies in a food processor to make fine crumbs. Add the butter; pulse to blend. Press the cookie crumbs onto the bottom of the prepared pan. Bake the crust for10 minutes or until set. Cool on wire rack. 3. Filling: In large bowl, combine the cream cheese, sugar and sour cream. Beat with a mixer on medium speed for 2 minutes until it is smooth, scraping down sides of bowl and beater once or twice. Beat in the eggs, 1 at a time, until blended. Finally beat in the remaining ingredients just until smooth and creamy; pour over crust. 4. 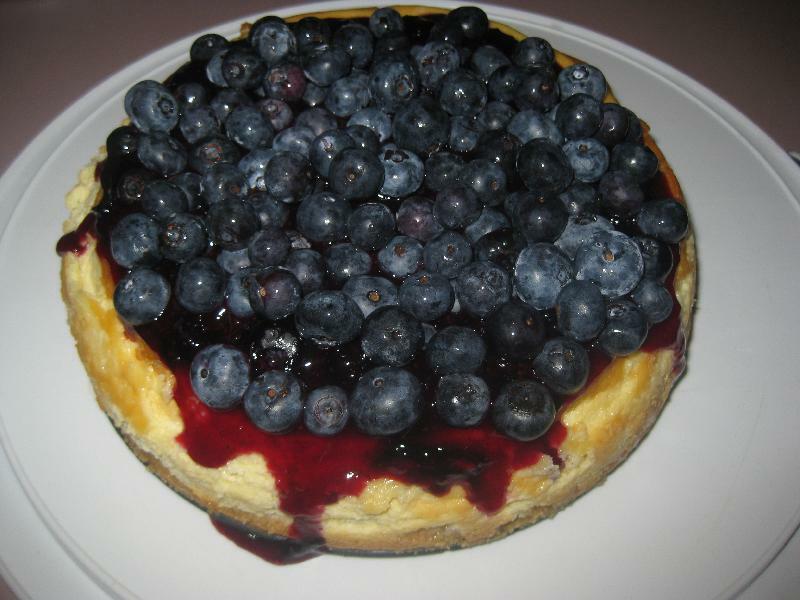 Bake the cheesecake for 60 minutes or until the cake is almost set and the center still jiggles slightly when touched. Remove it to a rack; cut around the outside edge of the cheesecake to loosen it from the sides. Cool the cheesecake on a rack for 3 hours (the cake will sink as it cools). Cover and refrigerate the cheesecake up to several days. 5. Topping: In a small saucepan, mix the sugar, cornstarch and water until blended. Add 1 cup of blueberries; mash the berries well with a potato masher. Cook over medium-high heat until the mixture comes to a full boil. Boil for 1 minute, stirring constantly, until slightly thickened. Stir in the lime juice and another 1?2 cup of blueberries. Spread on top of cheesecake; top the cheesecake with the remaining 11?2 cups of blueberries. Refrigerate until serving. anonymous : Wow! This sounds amazing! Copyright © 2007-2008 CakesToBake.com All rights reserved.